Commuters in Japan continue to be hoodwinked by the two-hole-one-bag system employed at train stations across the country. Local man Shinji Kawaguchi fell victim to the ruse in inner city Tokyo this morning wasting some genki deciding on which hole to insert his PET bottle. 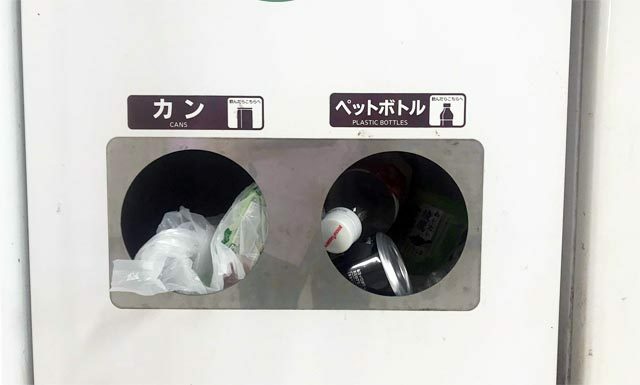 Despite the right hole being labelled 「ペットボトル – plastic bottles」, this hole led to the same garbage bag as the 「カン – cans」 hole. “I chose the right hole,” says Kawaguchi. Train station staff say they have more important things to do besides putting two garbage bags in one bin.